Q - Will it work in my yard? A - YES. The PetFence® works in yards of all sizes, regardless of layout. Q - Is my dog too big (or little)? A - The PetFence® has been proven safe and effective for all pets over 5 lbs. The adjustable collar allows you to create a perfect fit for your pet. Q - Will it hurt my pet? A - The mild correction pulses delivered when a pet crosses an established barrier are designed to get your pet's attention, but not punish him. This method has been proven safe and will not harm your pet. Q -I have a small pet and a large pet. Will this work for me? A - YES. The PetFence® is effective for all the dogs in your family. Q - When is my pet ready to start training? A - When your pet understands basic commands such as sit and stay; usually no earlier than an age of 16 weeks. Q - Once a pet is trained to the system what is the best way to take him out of the boundary? A - Create what is called an "invisible gate" and take the pet out only through this gate. Refer to the owner's manual. Q - Will the In-Ground Radio Fence keep other pets out of my yard. A - No, the pet must be wearing a PetFence In-Ground Radio Fence Receiver Collar. Q - The first time the pet receives the correction should he be on or off a leash? A - On the leash. This way the owner can easily redirect the pet to the appropriate behavior. Q - How long should the owner leave the flags up? A - The flags should remain for at least 2 weeks, but in some cases as long as 30 days. Q - What is meant by the Safe Zone? A - The area where the pet can roam freely without getting a static correction. Q - Is this a safe and effective way to train a pet? A - Absolutely. While the correction is unpleasant, it is harmless to your pet. Electronic training devices require interaction and training from the owner to achieve desired results. Therefore Radio Systems Corporation provides comprehensive video and training manuals with each training product. These tools were developed with veterinarians and animal behaviorists to ensure safety and peace of mind for you and your pet. Q - Can I use this system to train my dog to stop jumping over or digging under wood or metal fences? A - Yes. In fact approximately 40% of those buying a Radio Fence® already own an existing physical fence. Q – How quickly can I have my fence installed? A – We can usually install a fence within a week of your phone call! Q – Why are your prices considerably lower than some other companies? 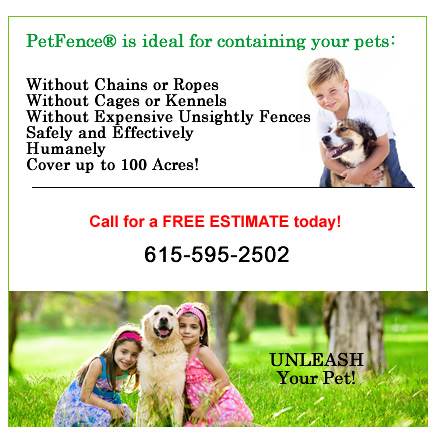 A – Pet Fence of Middle Tennessee is a small business without corporate underpinnings and overhead. While our services are professional and quality controlled, our costs of operation are kept low enough to pass on savings to clients. Q – Where are you headquartered from? A – Pet Fence of Middle Tennessee's home office is located in Nashville, TN. While our customer base stretches throughout Middle Tennessee, a strong majority of our clients reside in Williamson, Maury, and Davidson Counties. Q – How long have you all been in business? A – Pet Fence of Middle Tennessee was formerly Pet Safe of Middle Tennessee , and we have been serving Middle Tennessee for more than a decade as of the summer of 2005. Q – Are you the original Pet Safe dealer and installer in Middle Tennessee? Q – How many clients do you all have? A – 1,001 and growing every week! Q – How do I contact you all?